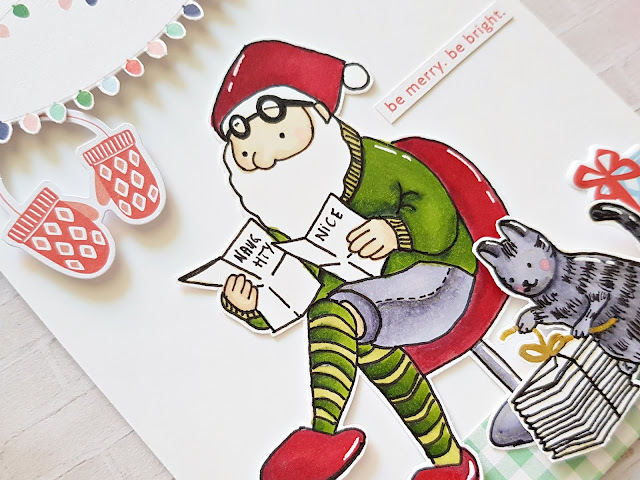 Welcome to the first day of the Pinkfresh Studio Holiday Cards Blog Hop! You should have arrived here from the super talented Wanda's blog! I always love seeing her beautiful projects and amazing photos on Instagram! For today's projects I wanted to use some older stamp sets from Pinkfresh Studio, that I haven't had a chance to work with yet! I don't know about you, but I hate leaving stamps and dies untouched, I need to try them all at least once! I wish I had time to use them more often too! The reason I haven't used these particular sets before is because I am not so into coloring, I simply have no patience for it. Which is weird because I really loved coloring as a kid! Oh well, I guess we all change! Back to the cards! On my first one I've used the adorable Festive Llama stamp set. There are also coordinating dies available but I fussy cut this one out because I was too lazy to take out my die cutting machine. Oh God, I feel a pattern emerging here (ie. I'm just lazy in general?!). I picked a pattern paper from the Holiday Vibes collection and matched my color scheme to it. Luckily I had some alcohol markers in matching colors, because I only have like 30 markers...I stamped the images in black ink and did very basic coloring, I didn't think it needed more. I made an A2 size top folding card base and adhered the patterned paper on top. I then die cut a basic oval shape from another patterned paper from the same collection and using foam tape, I adhered it down in the middle of the panel. I also added foam dots to my llama and presents and attached them to the oval shape. Last but not least I added a sentiment which is a sticker from last year's Christmas collection, December Days. Gosh, I loved that collection too! On my second card I've used another super cute set, Simple Joy! There's coordinating dies available for this set too, but again, as before, I was too lazy...:( Same as before, I created an A2 size top folding card base. Then I fussy cut a part of a patterned paper (with the lights) from the 6x6 pad in the Holiday Vibes collection and using foam adhesive I added it to the top part of my card. I also added a strip of green gingham paper at the bottom. I'll be honest, I accidentally colored the chair red and then there was no way for me to color Santa's pullover red too haha! In the end, I actually prefer the green, it's something different! I glued down Santa in the middle and added the kitty on foam dots. I tucked a puffy sticker present behind him. I love the mittens in the Holiday Vibes collection and thought they looked cute hanging from behind the lights, so I added them there! My sentiment I've cut out from the Very Merry patterned paper. That's it! I hope you like how these two cards turned out and I could inspire you in some small way! I've been making Christmas cards since July and I'm still not tired of them haha! I wouldn't mind making them all year round! Now for the fun part! Giveaways and promotions! - Each day 6 random comments will be picked to win a $25 gift card to the Pinkfresh Studio store. There will also be 2 grand prizes picked from the comments left on the Pinkfresh Studio blog posts: each day a different bundle of holiday stamps and dies. Prizes will be pictured each day on the Pinkfresh Studio blog. That is 12 chances to win over the two days plus the grand prizes! 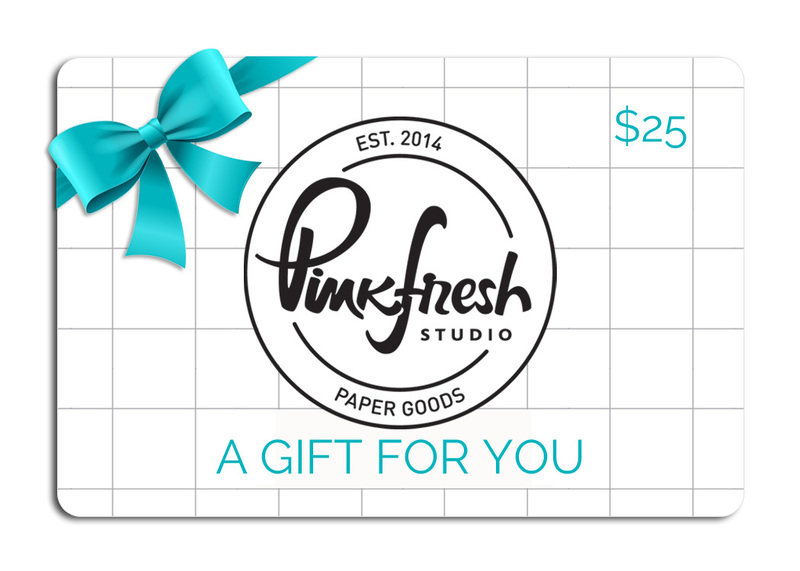 Winners will be posted on Sunday, November 11 by 2pm CST on the Pinkfresh Studio GIVEAWAY PAGE. You must check that page and claim your prize within 2 weeks! - The exclusive Holiday Vibes die will be added to any purchase in the Pinkfresh Studio store, free of charge! No promo code needed, it will automatically be added to your shopping cart. How cool is that? Even I don't have this die, boohoo! Phew, that's a whole lot of information! But I hope you've enjoyed this post anyway :). As always, I'm the last one in the hop hehe, so from here you go back to the Pinkfresh Studio blog! I'm also attaching the full blog hop list at the end of this post, for your convenience. Have fun hopping! * Full disclosure: I'm using affiliate links in this post, which you can use at no cost to you. oh, I LOVE these! That Llama and Santa are awesome! I think your cards are so precious. I love your llama!! So cute with his holiday presents. The Santa with his kitty is adorable!! Your coloring is awesome!! I love your use of pattern paper, I like to use it too!! Your cards are so adorable. Thanks for sharing. Looks like they saved the best for last :D Zsoka, you could not be lazy with the amount of projects you share! 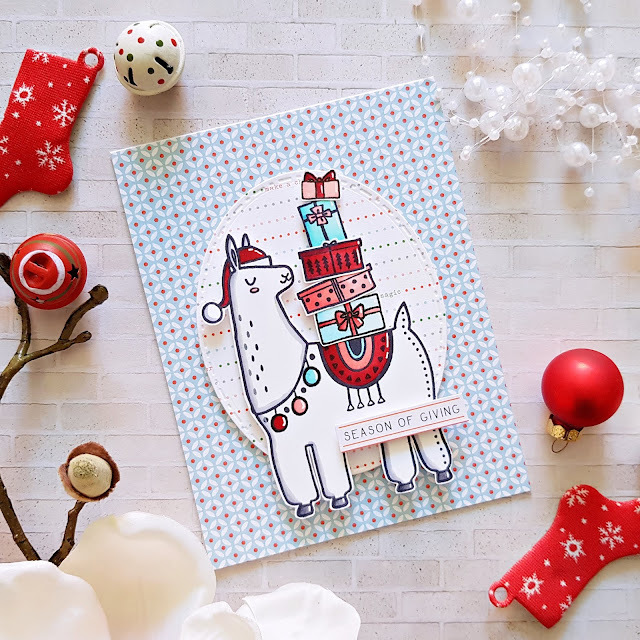 The Llama card is adorable and my favourite Christmas colour combo. Santa looks like he's in his casual, relaxing clothes at home :D I think he's awesome in green and I love kitty too. A Christmas llama! How original! So great! Your mistake was not a mistake... he really looks charming in green. Love that sweet kitten also. Nicely done. Great cards! The green is Santa's leisure wear! Love the llama too. Beautiful cards - Thank you for sharing your talent with us!! Such wonderful cards. Love the Santa with the cat. I love the llama and cross legged santa! Great coloring! Cute. I like your coloring and choice of papers. Your cards are so pretty. Love them both! Oh these cards are just so sweet. 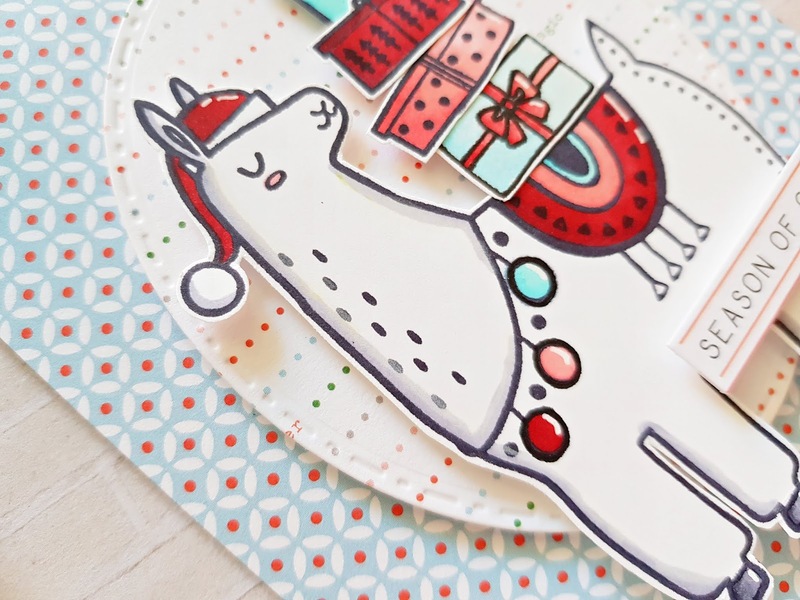 The pattern paper on the llama card is so perfect and wow can you color, that Santa looks printed its so perfect! These are such fun cards. I agree, the green sweater on Santa is an unexpected but perfect image! I love your designs...so adorable and whimsical. I especially love all the details on the Santa card. The string of lights are really sweet. I love your style and use of color on these cards! This is SO awesome! I love that llama! Both of these cards are just so adorable! Love them!! Love your fun as well as whimsical cards! Your designs are adorable, and your coloring is impeccable. These are great cards Zsoka, I especially like the Santa card it is SO SWEET! Love Santa in his slippers! Christmas Llamas are adorable. Great card designs. For someone who doesn't have the patience to color, you did a fabulous job on both cards! Very cute holiday cards! Thank you for sharing! Both of these are adorable. These are gorgeous, love your fun designs - all details added to perfection! Very beautiful cards. Love the pattern paper you have used in the first card. And the Santa reading letters is adorable! Oh your cards just bring a smile! Perfectly sweet and festive - fabulous cards! You so have me with the cute kitty cat sitting near the elf! And the llama--so lovely! Thanks for sharing. kitty watching over the letters. a little rest. Great cards. Love the little kitty sitting there. And your use of the designer paper. the twinkling lights are cool. These cards are just so adorable!! 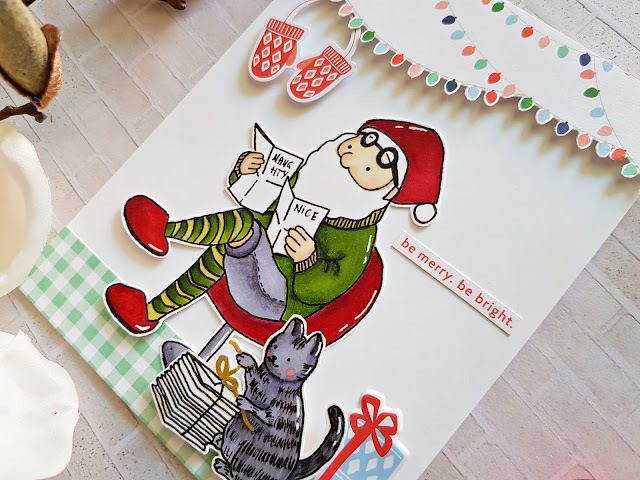 I love how you used the patterned paper, especially the lights and mittens on the Santa card. Loving these cards! Great mixes of papers and images! Especially loving the llama! I just adore these sweet scenes! The coloring is perfection. Those sweet cut-out Christmas lights, gah! Hello. You chose my favourite images to turn into fabulous cards. Love that snooty llama - he has such a superior look on his face, LOL and that crazy Santa is great and makes me smile. Both your cards made my heart happy, so thanks so much for sharing with us and making my day. Wonderful cards! So full of fun and merriment. Love the little kitty with Santa. Both of your cards are fabulous! Super fun and cheerful! Haha I love the green pulover, your cards are great as always! Such cute cards! The llama is stately and the cat is oh so cute! And I do love the green pullover for Santa! The llama especially is so sweet - adorable cards! Your cards are fun, cheerful, and great! You did a wonderful job matching your colors. Fantastic card - I love that llama and love your bold bright colours! 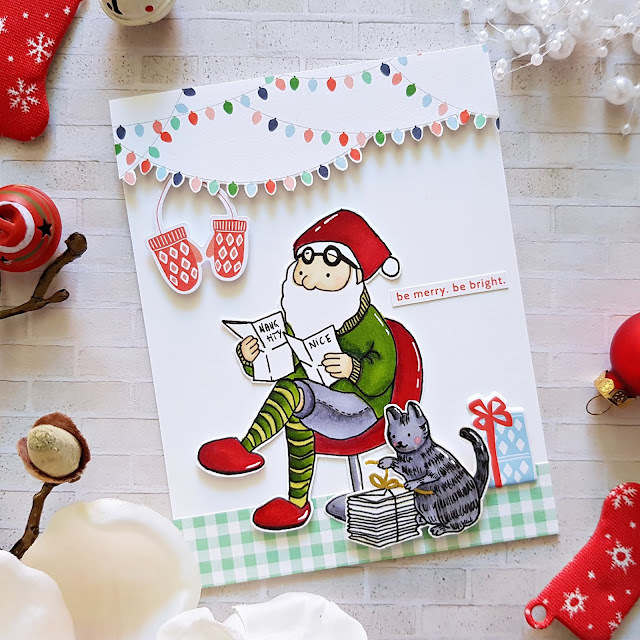 Love these cards and the Santa one is so much fun with the cute little kitty! Great job! Your cards are so fabulous. Love that llama. Great cards! Gotta love that llama! Awesome cards!! Great last stop!! Perfection in action!!! sweet cards with these adorable designs! Love your llama card, and the Santa with his cute kitty helper! Cute cards! The kitty in the Santa card had me laughing because my cat will take the bows and ribbons off of every gift. I don't even put them on any more. I love your use of patterned paper in both cards. Fabulous cards!! Your coloring is amazing!!! The Llama set is my favorite!! These images are oh so cute. I love how you stacked the presents on the Llama. And the santa scene is adorable! FYI - I have the card you sent me on display and it looks fabulous! Your cards are the best Zsoka! What great cards. I'm so impressed with your fussy cutting skills on the second card! And that kitty is too adorable. How did I miss that image when I saw that set? Thanks for sharing with us! Super cards- so very fun and colorful. Love all the detail! Love the partial diecutting on the last card?